Air Clicker invisible camera is a thumb Or forefinger camera containing lens, Digital storage media like MMC, SD card and shutter mechanism and its concept is same as other cameras such as Sony, Nikon and Canon but the only difference is that lens is mounted on blue-tooth enabled thumb Ring that is capable to responds to a motion sensor wrapping up by bendable finger. 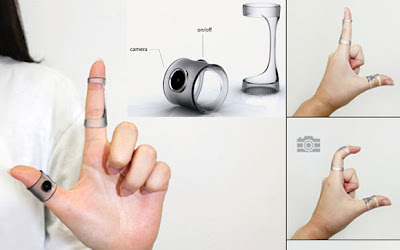 So you can wear a camera on your thumb and shutter button on your forefinger. When your finger goes to ‘Clicking’ action then lens read its position and take the picture. The picture is sent to a Bluetooth-connected Mobile Phone, which acts as an extension of the camera assembly. 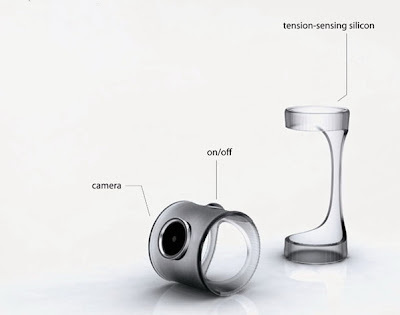 Air Clicker consists of two rings, one of which itself is directly the camera button and its on-off switch, and another track finger position in space and you can control the functions of this unusual camera. In order to make pictures with the Air Clicker, you need to make a characteristic gesture – sticking two fingers thumb and index fingers and simulate the shutter index with Air Clicker, you can also shoot videos.